Venerable Jampa Sangmo is a Tibetan Buddhist Nun. She was born in Hermosa Beach, California. Her practice began with Vipassana Meditation where she did numerous long retreats. She came to Tibetan Buddhism in 1993 and began her studies with several Buddhist Masters including Lama Zopa Rinpoche, H.E. Choden Rinpoche, Ribur Rinpoche and His Holiness the Dalai Lama. She took robes with her teacher Khensur Jampa Tegchok Rinpoche in 2008. 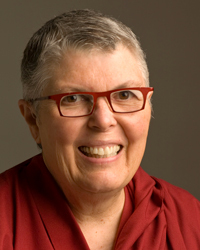 She has lectured and led meditation groups and retreats for Chevron International, Facebook Menlo Park Campus, Road Scholar (formally Elder Hostel), Spirit Rock Meditation Center, Ocean of Compassion, Land of Medicine Buddha (LMB), and Vajrapani Institute. View Venerable Jampa Sangmo's upcoming programs.